Offer letters are not required in the U.S. but it is considered to be a best practice to provide one to a potential employee. It’s always a good idea to have a formal written confirmation of the offer, so both the employee and the employer are clear as to the conditions of employment. This will help ensure that the employee is informed about their accountability and will be set up for success right from the start. Employers are sometimes afraid to give an offer letter because they feel it is a binding legal agreement or contract – and that is not true. Unless there is a clear or implied long-term promise of employment within that offer letter, the candidate has no legal recourse if the job doesn’t pan out. Even with the clear long-term promise, the candidate must still document hefty damages to themselves in order to justify an action in law. Clearly stating in the offer letter that the offer is for at-will employment. Avoiding using language that states, implicitly or explicitly, that the offer is an employment contract; unless you want the offer letter to serve as a contract. Documenting in the offer letter that conditions are dependent upon the successful completion of background checks such as; credit checks, reference checks, and drug tests. Avoiding language that implies any sort of guarantee for employment. Be sure to include a termination date for the offer, so that it does not remain open indefinitely. 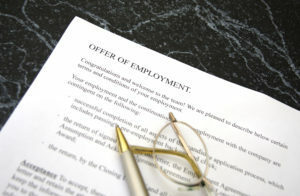 Some employers think that if they give an offer letter, they cannot withdraw a job offer. That is also untrue. Employers can withdraw job offers for any reason except one that discriminates against a protected class. Those classes include race, color, religion, creed, national origin or ancestry, age, physical or mental disability, veteran status, and genetic information or citizenship. Most states, have employment-at-will statutes, which also apply to rescinded job offers but again cannot discriminate against a protected class. If the company is not doing as well as when the offer was made and cannot afford to hire additional employees as previously predicted; such as a budget cut or re-organization. As long as the company can document changes in economic conditions, such as decreased earnings, they can usually rescind the job offers without suffering any legal consequences. If a potential candidate fails a criminal background check, or fails a drug test. If an employer can justify revoking an offer because the company can’t reasonably accommodate a disability, they may be able to rescind an offer to a disabled candidate. If the candidate acts inappropriately after the offer has been made. When do you give the offer letter? Once all candidates are screened and the interviews have been completed and you have decided who you would like to hire, be sure you conduct reference checks. This step protects the company from potential risk. Reference checks are considered an imperative pre-employment screening step before making a hiring decision. Most of the time, companies assume that they have all the information necessary to make a good hiring decision. You would hope that applicants are telling the truth on their resumes, and most of the time they are; however, there are few areas where information can be hidden from the employer. To ensure that your company is hiring the right person, reference checks need to take place. If satisfied with the reference check, you will be ready to make the initial verbal offer. You can do this through speaking to the person directly, in person, over the phone or even via web conferencing system. It should be brief, outlining general information such as job title and salary, including classification and start date. Let the potential employee know the next steps in the process. Once these steps are taken, then you are ready for the written offer letter. You will want to get the letter to the potential employee as soon as you can, so there is plenty of time for the person to receive, read and digest the information contained in the letter. A good practice is to wait until the chosen candidate has signed and returned the offer letter before you let any other candidates know that the position has been filled. It is never a guarantee that the candidate will accept the offer even though they applied for the position and seemed excited about your company. Finally, once received, the offer letter should be stored with other important documents in the employee personnel file.